For the first time, a boy walks his younger sister home all by himself. Big brother is proud of his newfound responsibility: walking his little sister home from the school bus stop. He takes his duty very seriously as he tries to keep up with his sister’s boundless energy. The narrator keeps a watchful eye on little sister as she picks up trinkets, chases dogs, and hides from squirrels. Even though he thinks the trinkets she collects are trash, he doesn’t discourage her curiosity. He thoughtfully answers her many questions. The siblings stop for a quick game of medieval knights, dueling with tree branches. Little sister slips on a puddle when their walk is interrupted by a thunderstorm. Big brother soothes her and they make it home after the storm passes. Lam captures the earnest relationship between young siblings. Her soft-colored pencil-and-watercolor illustrations flow with little sister’s energy. 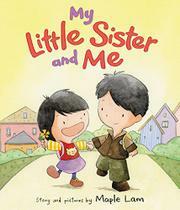 Young readers will relate to the siblings’ animated reactions to each part of their walk. Her characters’ simple facial features are boldly expressive with just a few lines. Asian-American Lam’s siblings and mom are black-haired and golden-skinned, though their physiognomies are ethnically ambiguous.